Before joining Local 4, Steve Garagiola hosted his own daily sports show at Michigan’s cable sports network, PASS Sports. 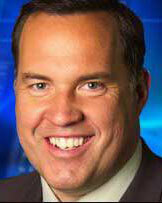 Prior to that he covered sports at KTSP-TV in Phoenix, and from 1980 to 1989 at WXYZ-TV in Detroit. Steve Garagiola‘s fondness for sports comes naturally given his family background. He’s the son of Hall of Fame sportscaster and former major league catcher Joe Garagiola. Steve’s older brother, Joe Jr., is the general manager of the Arizona Diamondbacks. When not at work, Garagiola, loves to cook, describing it as relaxing, “cheaper than therapy.” But his passions are for writing and his family which are the driving forces behind his new book TV News — Writing and Surviving.